Author: Holger Tröbs. Series edited by: Raimund Kastenholz. 16 pp. Roman, 281 pp. The languages and dialects of the Manding subsection of the Niger-Congo family are closely related to each other and exhibit great similarities in lexicon and morphosyntax. Characteristic to this dialect continuum is the comparatively rare and noteworthy constituent structure [S-AUX-O-V-Other] or [S-AUX-DO-V-IO-PP]. The auxiliaries (AUX) here stand for free, invariable portemanteau morphemes, combining time/aspect/mode and polarity markers. This language type is described as ‘split predicative’, since the verb (V) is separated from the auxiliary with its TAM markers by the direct object (DO). The structural features of Manding are explained by the way of describing the origins and development of the TAM system. To do that, two different functional-typological concepts, besides the grammaticalization theory, are employed. These allow to not only lay open the language foundation of Manding, but also to understand the emerging grammatical particularities in an ever-widening context. The underlying theories here are the “immanent-typological” approach by Hans-Jürgen Sasse and the Universals Project Cologne (UNITYP). Using the theories and approaches mentioned above, the split predicative structure of Manding and the resulting fixed position of the auxiliaries are explained as a correlation of the parameters patiens orientation and viewpoint (DeLancey 1982). This study consists of the revised edition of the habilitation thesis by Holger Tröbs, Johannes Gutenberg University of Mainz, Germany. 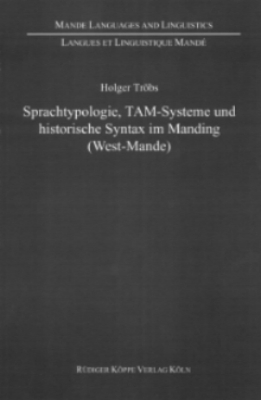 To sum up: it is a solid piece of academic writing, a compendium of current views of Mandeists on some crucial points of Manding language structure, an attempt to put them into the context of modern linguistic theory.